Sealing in Tasmanian waters predated the founding of the colony. George Bass remarked to Matthew Flinders that, while examining Wilson's Promontory in 1798, his boat lay in 'Sealers Cove' and that he 'was of opinion, that upon these [Bass Strait] islands a commercial speculation on a small scale might be made with advantage'. Flinders confirmed that same year that seals abounded in the Furneaux Group. In 1798 Flinders and Bass in Norfolk were accompanied to Bass Strait by Charles Bishop, who harvested 5200 fur seal skins (Arctocephalus pusillus) and 350 gallons of oil. Bishop repeated his success at the Kent Group in January 1799, gathering 9000 skins. He was followed by other sealers to the extent that, by 1806, unrestrained killing saw seal numbers declining. King Island was sighted by sealer William Reed in Martha in 1799, and when Baudin visited the island in 1802, gangs gathering elephant seals (Mirounga leonina) for oil were firmly established. By May 1803 Governor King reported to Nepean his concerns as to over-fishing. 'Since I took command 16,000 gallons of oil and 27,846 seal skins' had passed through Sydney and 'I shall find it expedient to restrain individuals from resorting there in too great numbers'. In 1804 his concern at the number of sealers, including American vessels, in local waters led him to order that no foreign vessels were to be cleared from the Derwent. Meanwhile Sydney merchants, such as Robert Campbell and Kable & Underwood, dropped gangs on islands, to be picked up when a harvest had been gathered. The product was usually exported to China or England. With some sealers being escaped convicts and deserters, lawlessness was rife. The Aboriginal community was exploited, particularly on the Furneaux Group, with women seized to become 'wives' and capture seals, while the men 'made good sealers'. 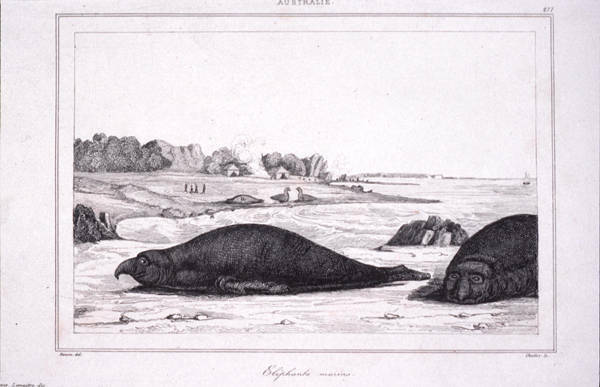 Elephant seals on Macquarie Island were, by July 1820, 'not now to be procured' due to the widespread practice of killing pups and mothers indiscriminately. By 1833 the sealing industry had declined markedly; in 1838 it was practically over, George Frankland reporting 'in consequence of the reckless and improvident system of destruction followed by the seal hunters, the valuable animal is nearly extirpated from our neighbourhood'. Further reading: L Murray, 'An account of the whaling and sealing industries of Van Diemen's Land to 1850', thesis, UT, 1927; N Plomley & K Henley, The sealers of Bass Strait, Hobart, 1990.